The superconducting magnets in the LHC must be supercooled to 1.9C above absolute zero, to allow them to steer particle beams around the circuit. 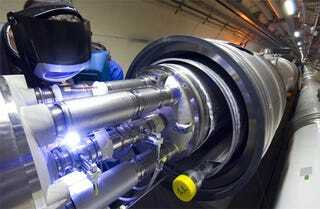 As a result of the [leak], the temperature of about one hundred of the magnets in the machine's final sector rose by around 100C. A spokesman for Cern confirmed that it would now be difficult, if not impossible, to stage the first trial collisions next week. Further delays could follow once the damage has been fully assessed over the weekend.